As we all know all too well, you can't win 'em all. 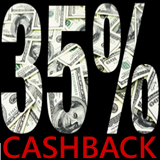 That's why, this weekend, Intertops Poker and Juicy Stakes Casino are giving 35% Instant Cashback to players that bust a deposit playing any of their real-money slots from Worldmatch. Cashback is an easy alternative to deposit bonuses. If you play through their deposit without a win this weekend, just contact customer service by Wednesday and ask for 35% of your last deposit back. It will be instantly credited to your account so you can get right back to playing. Play-through on this bonus refund is just 10X. There is no max cashout. Players can request a refund if they bust a deposit playing Worldmatch slots at Intertops Poker or Juicy Stakes, January 19-21, 2018. Other popular Worldmatch titles include Banana King HD, where chimps applaud their sovereign, Night Vampire HD with three Bonus Games and, inspired by sci-fi novels, Robotika HD (https://poker.intertops.eu/en/promo/305-worldmatch-top-games). 35% Instant Cashback is available when you play Worldmatch slots January 19-21, 2018.